It’s a long weekend where I live (to celebrate Queen Victoria’s birthday 😀) and we didn’t have many commitments, so I got to sit around and play with beads! With the new pale grey colour coming out soon, I thought I’d play around with some of the soft colours in the True Beadz line. The first bracelet I made up with a plant in mind that I call ‘Snow in Summer’, which has white flowers with a yellow center. 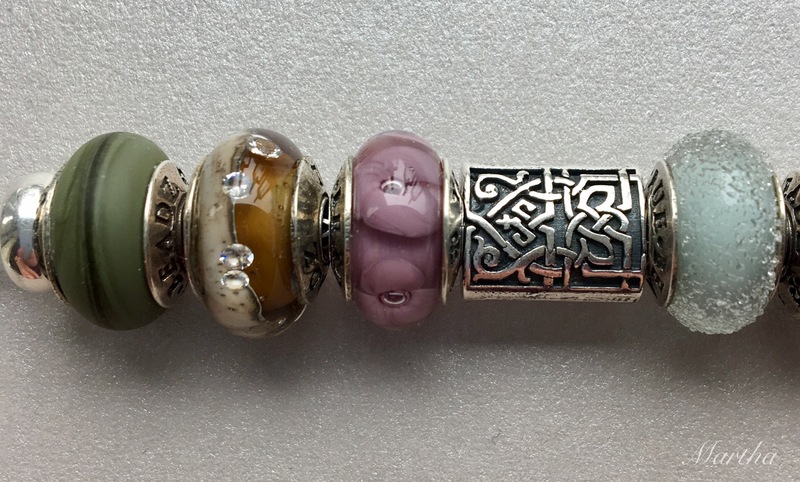 At the center of the bracelet is a Treasure, but the rest are in the regular collection. Starting on the top right and going clockwise are The Wheel of Time, Touch Linen, Blossom Siberia, Air Linen, 3 Roses, Blossom Sunlight Spot, a Treasure, Blossom Sunlight Spot, Silver Lilac, Air Linen, Alchemy Snow, Taste Linen and another The Wheel of Time. 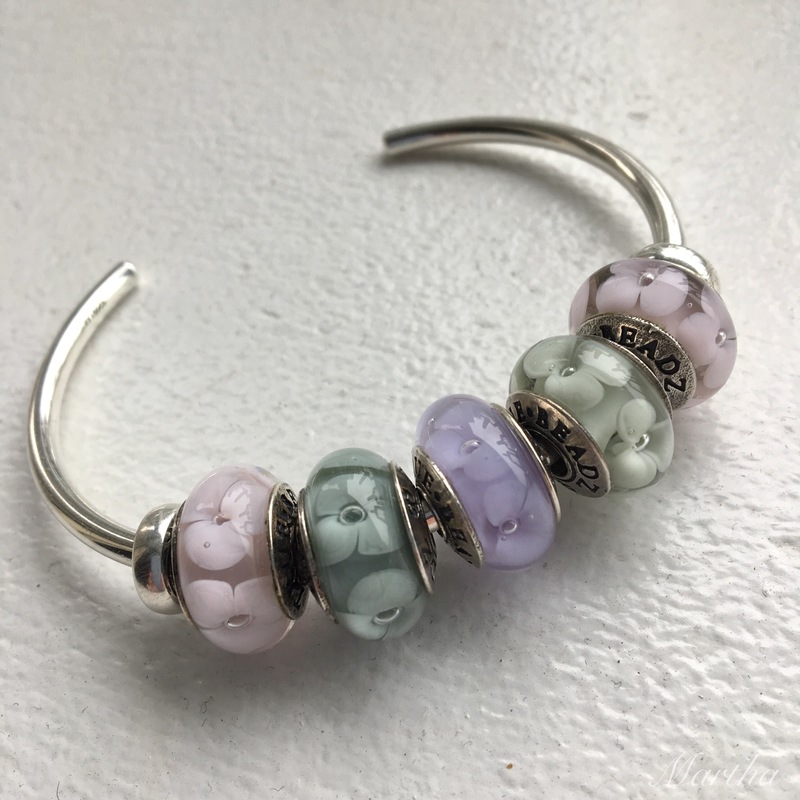 A simple bangle of just Blossom beads can be so pretty. On either end are Baby Pinks, then left to right are Blue Mist, Lilac and Linen shades. I also wanted to try out something with soft blues. 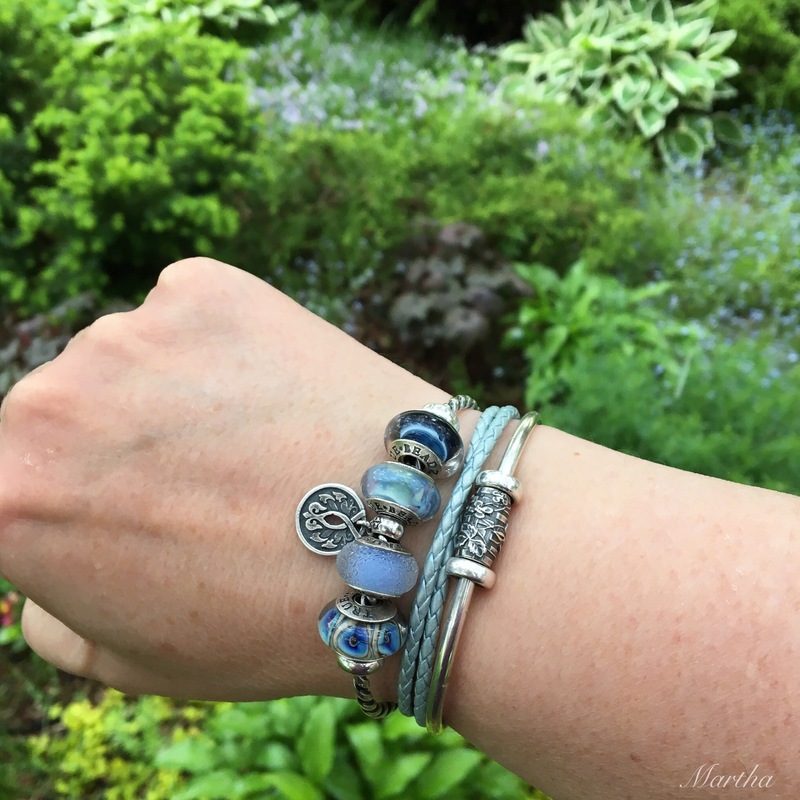 Below left to right are Air Stormy Heavens, Dancing Fairies Stream, Firebird Dangle, Taste Sky Blue and Dragon Eyes Mystery. I also made up a very unusual colour combo. Julia described it as a maple-purple bracelet. 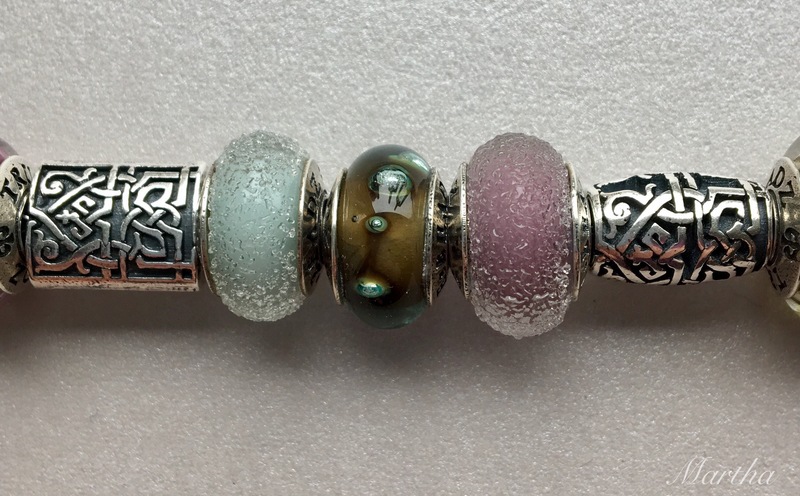 Below left to right are Touch Dragon Green, a Treasure, Blossom Purple Dream, Once Upon a Time and Taste Blue Mist. Below left to right after the Taste Blue Mist are a Treasure, Taste Purple Dream and Roots. Below left to right after the Roots are two Treasures and then Touch Dragon Green. So, I sure had a lot of fun playing around with these beads. I don’t know if you guys get much time to just sit and play, but I need to do it more often. 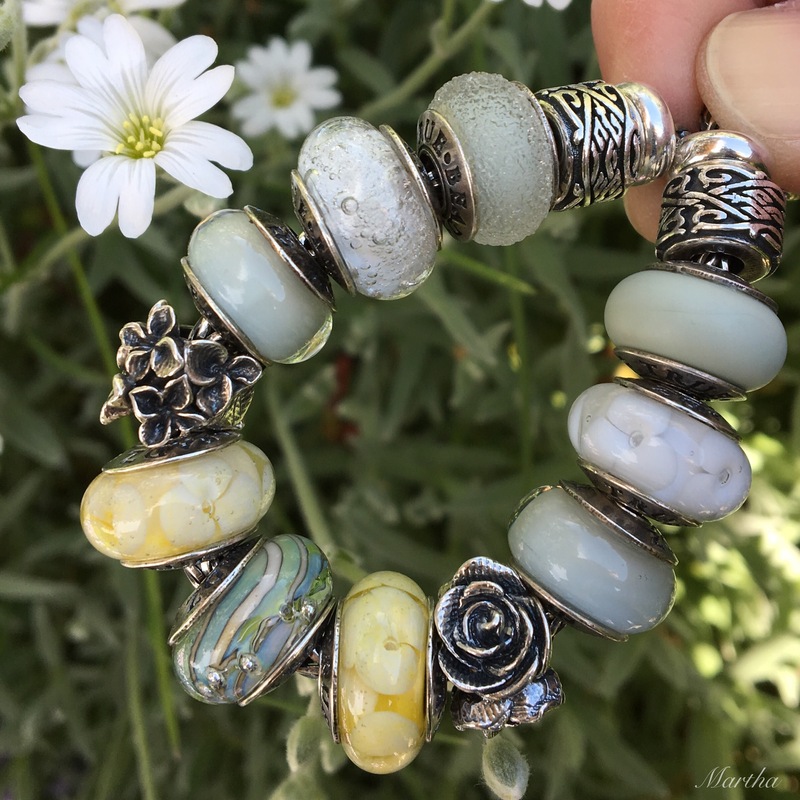 Out of all these beads I absolutely adore the look of the Blossom Sunlight Spots with the striped Treasure as I think it’s very fresh looking. It’s very easy to want every colour group of True Beadz, but what is your current favourite? Great post. 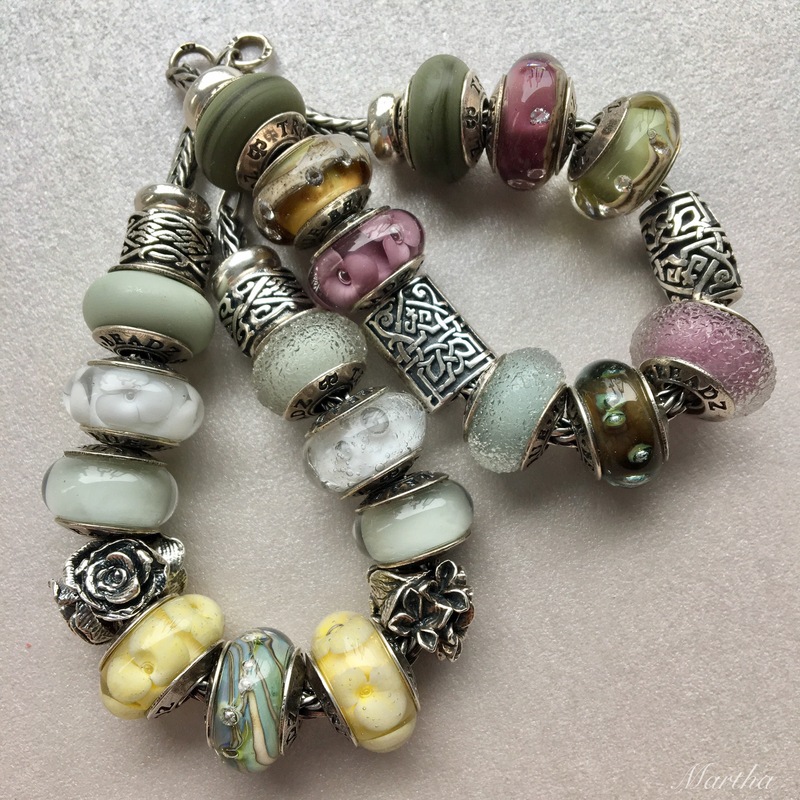 I always enjoy seeing anyone’s pictures of Julia’s beads as they blend so well with so many different brands of beads. I got my first two true beadz in the st Patrick’s release and have acquired many others in a short time and they are easily becoming my favorite glass. I have my first touch on the way ( blue mist ) and can’t wait. I love love the treasures you have that have little cz and sand in them. Alex, I’m so happy you got a Blue Mist as that is my favourite colour. 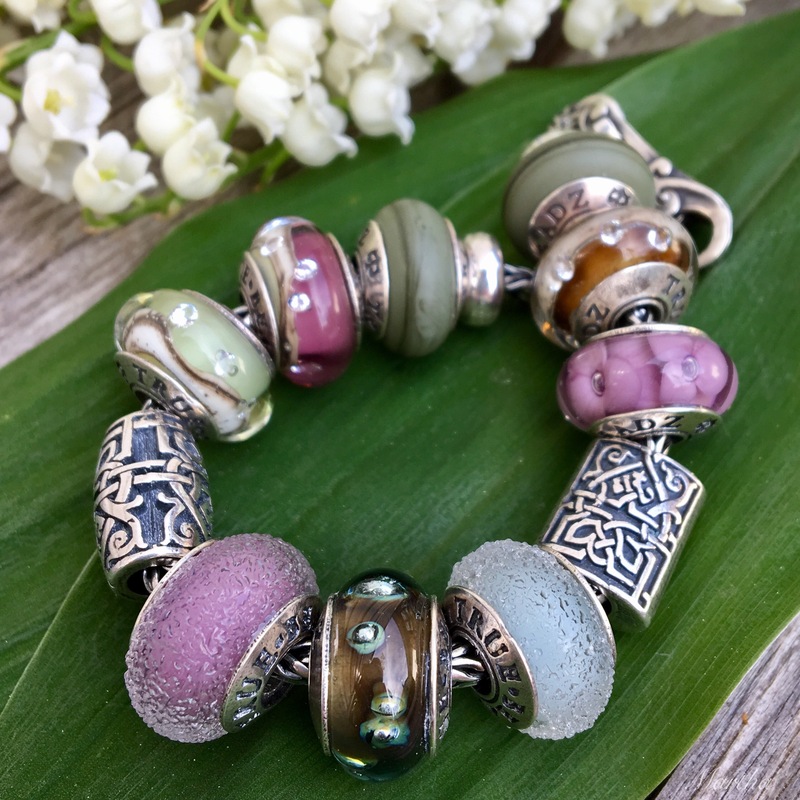 It’s so unusual in the bead world and simply divine! Those Treasures I have are fab and caused quite a ruckus last summer as they were hard to get, so I haven’t shown them much. Hope you have a great day! Love this post! The morale of the story, I need more TrueBeadz! Julia would be happy to hear that, LOL! impossible to choose a favorite- I love every single combination you’ve done here. All the True Beadz go together so beautifully , you just can’t go wrong. Thanks Suzanne and Alex! I am lucky to have these beauties and you’re right, I shouldn’t shy away from wearing/photographing them. I really do love how easy it is to put all the different colours together. Enjoy your holiday! Ours here is next weekend, and I’m looking forward to the day off, and hoping we’ll get some nice weather for it. Hi again Martha, I just saw your red leather bracelet combination on Instagram. Is that another one of your bead playing sessions? Because WOW! Yes! It’s the Cherry/Sage Green Leather Bracelet with the Dancing Fairy Pendant. 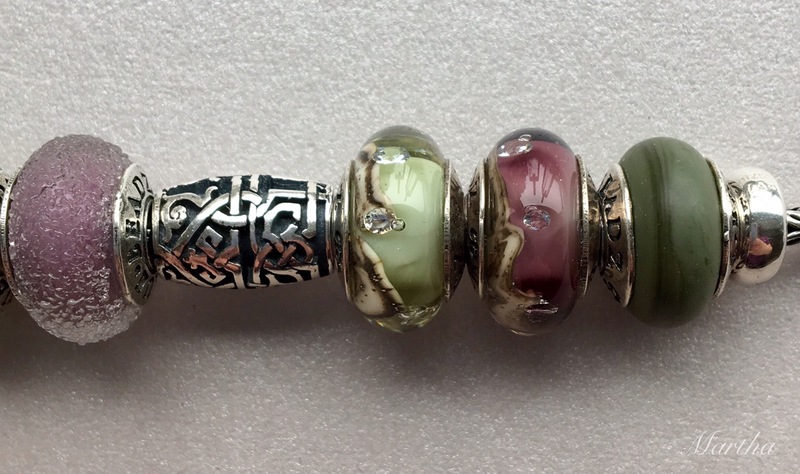 I was thinking about what to do for my next blog post and I haven’t really featured the little fairies and trolls from the Trollbeads spring collection. 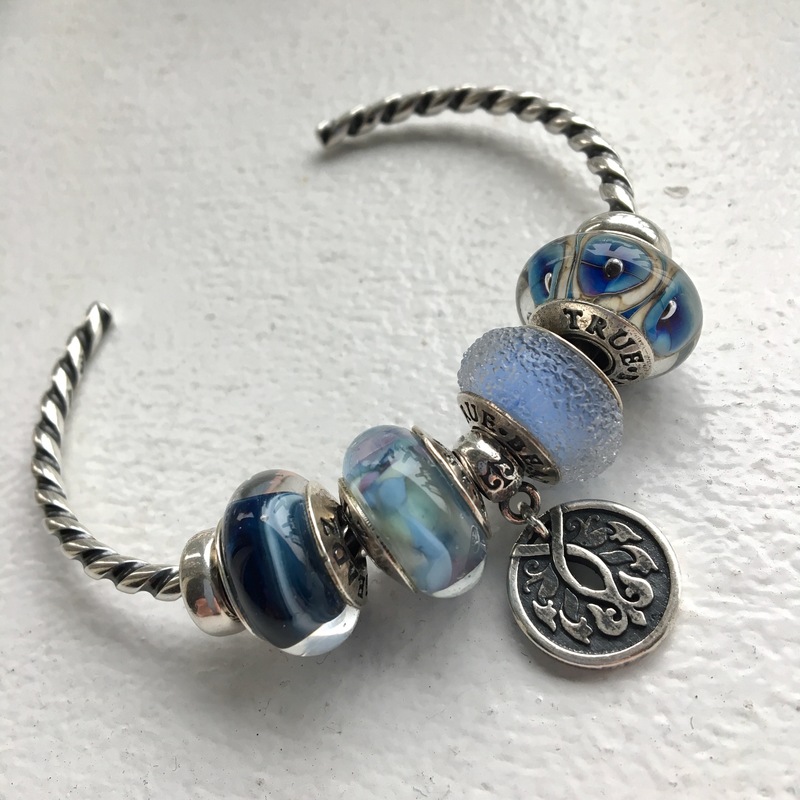 I adore the pendants, but if I wear them on the Neck Bangle then I can’t see them! It’s a bit too long to wear on a bangle with the legs pointing down to your fingers, but by turning it this way and putting it on the leather bracelet with the lock at the top, it fits really well! I’ve been wearing it for a few hours and stays put so well that I would even wear it to work if I knew I had to conduct some band classes! It took me a bit to figure out that it was the Dancing Fairy Pendant. I didn’t plan on getting it because I don’t wear necklaces, but now when I see it used like this, I guess another addition for my wishlist. I’ll go make a little video right now of how it sits and post it on the blog post in a couple of days. It’s not inexpensive, but such a little work of art. I love the unusual combos you showed here! so many possibilities!!! Thanks Julia! It’s so easy with how the colours work together. I hope you enjoyed your first warm day! The list just never ends, does it?